We are a family owned Pooper Scooper business that provides pet waste removal services in New Jersey. Weekly poop scoop services start at only $12. Our pooper scoopers are friendly, reliable and thoroughly trained to keep your yard clean of dog poop. What Causes White Dog Poop? Your dog's poop can tell you a lot about his or her health. That's why there are 5 qualities of dog poop that we regularly check when we are poop scooping in our clients' yards. Color is one of them and white dog poop is something we come across with relative frequency these days. We're moving along, picking up brown dog poop as usual ... when suddenly: a white, chalky deposit! Where has it come from? And what does it mean?? No, it isn't an old poop. No, it hasn't simply dried up or been bleached by the sun. So what is the deal here? If you suspect that obstipation (serious and obstinate constipation) is becoming the issue then you should talk to your vet. For daily preventative measures to insure against constipation we suggest taking a look at this article from Healthy Pets. Exercise, plenty of water, species-appropriate dietary fiber, probiotics and more will help your dog have regular and healthy poops. There is a chance that your dog is pooping white because of something unusual that he or she is eating. If your dog likes to pick in the garbage or get into paper products like paper towels, toilet paper and tissues then this might be the reason for the color change. Try limiting your dog's access to such items and see if the problem persists. 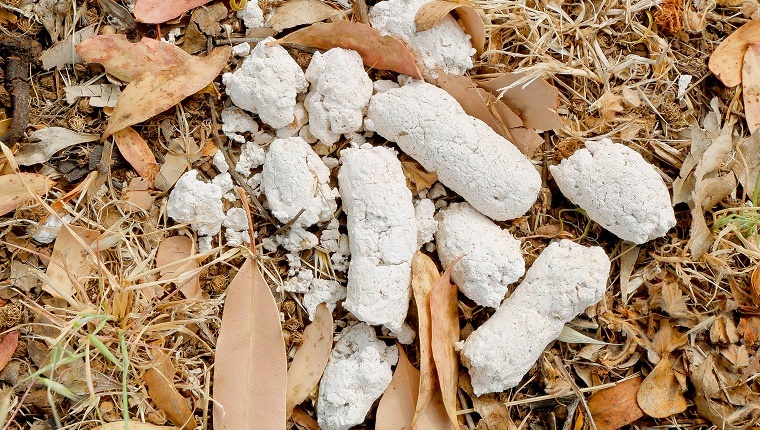 White specks in your dog's poop are another story entirely. If you are seeing what looks like white polka dots or rice grains in your dog's poop then those are worms! These are easily treatable so it's just time to call your vet. We will cover other colors of dog poop (green, gray, black, etc.) in future blog posts so be sure to stay tuned. Copyright 2016 © Big Business Scoopers of NJ, LLC. All Rights Reserved.